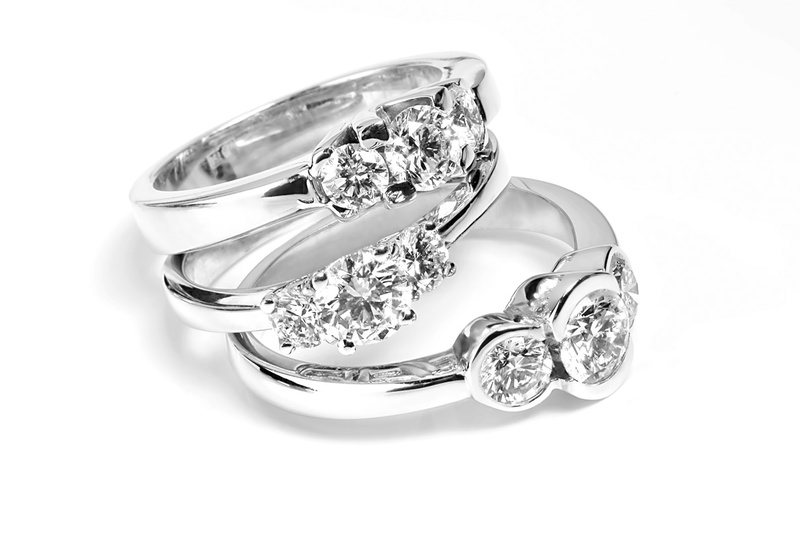 Whether ’tis nobler to use platinum or white gold? Platinum or white gold? What do I make my wedding and engagement set out of? It’s a personal choice and one everyone has to make. White gold is by far the most popular choice these days. Platinum, sometimes. It is seen as much more expensive and not an option. I counter that assumption! “Modern” white gold is produced by adding nickel, zinc, silver and/or palladium to pure gold to make it white. This alloy was produced to replace platinum as platinum was declared a strategic material for WW2 and prohibited for non-military use. Hence the introduction of 14K and 18K white gold. White gold is not exactly white, as the gold part cannot be completely transformed into white except for the addition of the alloys to make it white. White gold is commonly plated with rhodium to make it white. So you have this gold, alloy and thein you use a platinum group metal to make the white gold white. Hmmm… While white gold alloys are usually less expensive that platinum, let’s examine closer the differences between the two metal groups. Making and wearing jewelry are definitely two considerations of the differences between white gold and platinum. White gold is still gold. It is slightly yellow and usually rhodium plated. This plating needs to be redone over time. So the ring would have to be re-polished and re-plated. White gold also usually contains nickel and some people have allergies to nickel. White gold can be alloyed palladium and this alloy is usually more expensive that other white gold alloys, but less expensive that platinum. Palladium is a good choice if you are allergic to nickel. Platinum is a great metal to use for wedding jewelry. It is very white, usually on the gray side and while somewhat soft, it is very durable. Platinum is about 21.45 and 14K 12.61 specific gravity. This means that platinum is 60% heavier that the 14K gold!! This is why it is more expensive, the weight of the same ring 14K vs platinum the platinum ring will be much heavier. Platinum is also very hard on a jewelers tools and decreases the time the tools can be used. It Platinum casts at 3254°F (1790°C) while gold casts at 1737°F (179°C). IT takes specialized equipment and a very high temperature to cast platinum. Platinum vs gold for a wedding set? It’s up to each person to decide which is best for them to use!